Saginaw Bay walleye fishing in the Slot from Sunset Bay up to Thomas Road was very good with many limit and near-limit catches reported. Walleye fishing was very good in Wildfowl Bay and around Sand Point. Most are using crawler harnesses with spinners in purple, pink, brass and chartreuse. There’s a fair amount of catch and release bass fishing in Wildfowl Bay, around the islands and off Port Austin and Grindstone City however the bass opener will depend on the weather and how cold the water is especially around the Thumb. Everything is running about a week later than normal this year. Some walleye were caught off the breakwall at Port Austin at night. Chinook, steelhead and lake trout were caught in 40 to 60 feet in the area of Alaska Bay and Burnt Cabin Point located between Port Austin and Grindstone City. Au Gres stained water from the Au Gres River was limiting success so boat anglers were going south and fishing off the Pine River. They reported some limit catches of walleye early or late in the day in six to 10 feet or at the Catfish Hole in 18 feet. A few boats were heading way out to the Steeples which is north of Big Charity Island. Au Gres River those surfcasting body baits near the Singing Bridge caught walleye in the evening. One Atlantic salmon was also caught. Quanicassee River anglers are still getting a few walleye and some catfish out of the lower river. Oscoda pier fishing has been steady for walleye and steelhead moving in and out of the river. A good number of walleye are moving in. Anglers have done well when drifting crawlers and stick baits in the early morning and throughout the night. Au Sable River steelhead are still coming up into the river and were on the beds. This has been a late run, but the fish are still coming in good numbers. Flies, wax worms, small spoons and spinners are working well. Tawas Area boat anglers were trolling the point and beyond but the walleye action was slow. Pier anglers caught the occasional Atlantic salmon, pike and catfish. Tawas River was producing pike. 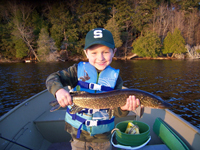 Weekly Fishing Tip: Northern pike season open – now get out there and fish! Seasons for northern pike are finally open across the state – will you soon be getting out to try your hand at northern pike fishing? 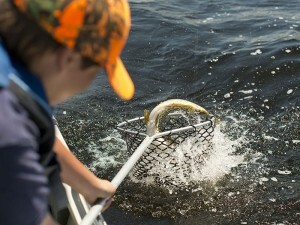 Want to learn even more about northern pike in Michigan? Read our detailed informational sheet about this toothy predator online!